This article is about the NASA manned spaceflight program. For other uses, see Mercury project (disambiguation). Project Mercury was the first human spaceflight program of the United States, running from 1958 through 1963. An early highlight of the Space Race, its goal was to put a man into Earth orbit and return him safely, ideally before the Soviet Union. Taken over from the US Air Force by the newly created civilian space agency NASA, it conducted twenty unmanned developmental flights (some using animals), and six successful flights by astronauts. The program, which took its name from Roman mythology, cost $2.2 billion adjusted for inflation. [n 2] The astronauts were collectively known as the "Mercury Seven", and each spacecraft was given a name ending with a "7" by its pilot. The Space Race began with the 1957 launch of the Soviet satellite Sputnik 1. This came as a shock to the American public, and led to the creation of NASA to expedite existing US space exploration efforts, and place most of them under civilian control. After the successful launch of the Explorer 1 satellite in 1958, manned spaceflight became the next goal. The Soviet Union put the first human, cosmonaut Yuri Gagarin, into a single orbit aboard Vostok 1 on April 12, 1961. Shortly after this, on May 5, the US launched its first astronaut, Alan Shepard, on a suborbital flight. Soviet Gherman Titov followed with a day-long orbital flight in August 1961. The US reached its orbital goal on February 20, 1962, when John Glenn made three orbits around the Earth. When Mercury ended in May 1963, both nations had sent six people into space, but the Soviets led the US in total time spent in space. The Mercury space capsule was produced by McDonnell Aircraft, and carried supplies of water, food and oxygen for about one day in a pressurized cabin. 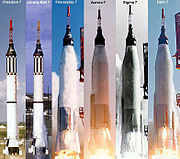 Mercury flights were launched from Cape Canaveral Air Force Station in Florida, on launch vehicles modified from the Redstone and Atlas D missiles. 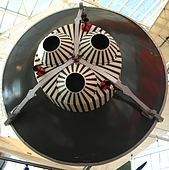 The capsule was fitted with a launch escape rocket to carry it safely away from the launch vehicle in case of a failure. The flight was designed to be controlled from the ground via the Manned Space Flight Network, a system of tracking and communications stations; back-up controls were outfitted on board. 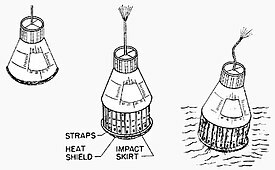 Small retrorockets were used to bring the spacecraft out of its orbit, after which an ablative heat shield protected it from the heat of atmospheric reentry. Finally, a parachute slowed the craft for a water landing. Both astronaut and capsule were recovered by helicopters deployed from a US Navy ship. The Mercury project gained popularity, and its missions were followed by millions on radio and TV around the world. Its success laid the groundwork for Project Gemini, which carried two astronauts in each capsule and perfected space docking maneuvers essential for manned lunar landings in the subsequent Apollo program announced a few weeks after the first manned Mercury flight. Following the end of World War II, a nuclear arms race evolved between the US and the Soviet Union (USSR). Since the USSR did not have bases in the western hemisphere from which to deploy bomber planes, Joseph Stalin decided to develop intercontinental ballistic missiles, which drove a missile race. The rocket technology in turn enabled both sides to develop Earth-orbiting satellites for communications, and gathering weather data and intelligence. Americans were shocked when the Soviet Union placed the first satellite into orbit in October 1957, leading to a growing fear that the US was falling into a "missile gap". A month later, the Soviets launched Sputnik 2, carrying a dog into orbit. Though the animal was not recovered alive, it was obvious their goal was manned spaceflight. Unable to disclose details of military space projects, President Eisenhower ordered the creation of a civilian space agency in charge of civilian and scientific space exploration. Based on the federal research agency National Advisory Committee for Aeronautics (NACA), it was named the National Aeronautics and Space Administration (NASA). It achieved its first goal, an American satellite in space, in 1958. The next goal was to put a man there. The limit of space (also known as the Karman line) was defined at the time as a minimum altitude of 62 mi (100 km), and the only way to reach it was by using rocket-powered boosters. This created risks for the pilot, including explosion, high g-forces and vibrations during lift off through a dense atmosphere, and temperatures of more than 10,000 °F (5,500 °C) from air compression during reentry. In space, pilots would require pressurized chambers or space suits to supply fresh air. While there, they would experience weightlessness, which could potentially cause disorientation. Further potential risks included radiation and micrometeoroid strikes, both of which would normally be absorbed in the atmosphere. 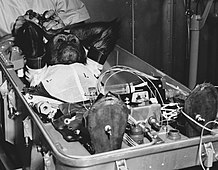 All seemed possible to overcome: experience from satellites suggested micrometeoroid risk was negligible, and experiments in the early 1950s with simulated weightlessness, high g-forces on humans, and sending animals to the limit of space, all suggested potential problems could be overcome by known technologies. Finally, reentry was studied using the nuclear warheads of ballistic missiles, which demonstrated a blunt, forward-facing heat shield could solve the problem of heating. T. Keith Glennan had been appointed the first Administrator of NASA, with Hugh L. Dryden (last Director of NACA) as his Deputy, at the creation of the agency on October 1, 1958. Glennan would report to the president through the National Aeronautics and Space Council. The group responsible for Project Mercury was NASA's Space Task Group, and the goals of the program were to orbit a manned spacecraft around Earth, investigate the pilot's ability to function in space, and to recover both pilot and spacecraft safely. Existing technology and off-the-shelf equipment would be used wherever practical, the simplest and most reliable approach to system design would be followed, and an existing launch vehicle would be employed, together with a progressive test program. 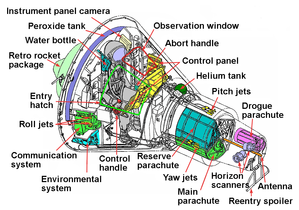 Spacecraft requirements included: a launch escape system to separate the spacecraft and its occupant from the launch vehicle in case of impending failure; attitude control for orientation of the spacecraft in orbit; a retrorocket system to bring the spacecraft out of orbit; drag braking blunt body for atmospheric reentry; and landing on water. To communicate with the spacecraft during an orbital mission, an extensive communications network had to be built. In keeping with his desire to keep from giving the US space program an overly military flavor, President Eisenhower at first hesitated to give the project top national priority (DX rating under the Defense Production Act), which meant that Mercury had to wait in line behind military projects for materials; however, this rating was granted in May 1959, a little more than a year and a half after Sputnik was launched. Twelve companies bid to build the Mercury spacecraft on a $20 million ($172 million adjusted for inflation) contract. In January 1959, McDonnell Aircraft Corporation was chosen to be prime contractor for the spacecraft. Two weeks earlier, North American Aviation, based in Los Angeles, was awarded a contract for Little Joe, a small rocket to be used for development of the launch escape system. 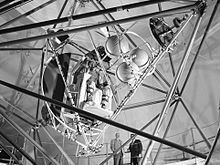 [n 4] The World Wide Tracking Network for communication between the ground and spacecraft during a flight was awarded to the Western Electric Company. 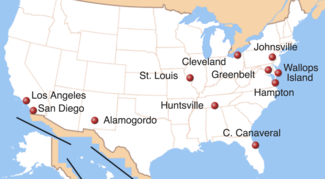 Redstone rockets for suborbital launches were manufactured in Huntsville, Alabama by the Chrysler Corporation and Atlas rockets by Convair in San Diego, California. For manned launches, the Atlantic Missile Range at Cape Canaveral Air Force Station in Florida was made available by the USAF. This was also the site of the Mercury Control Center while the computing center of the communication network was in Goddard Space Center, Maryland. 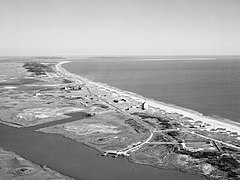 Little Joe rockets were launched from Wallops Island, Virginia. 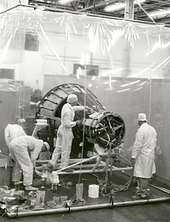 Astronaut training took place at Langley Research Center in Virginia, Lewis Flight Propulsion Laboratory in Cleveland, Ohio, and Naval Air Development Center Johnsville in Warminster, PA. Langley wind tunnels together with a rocket sled track at Holloman Air Force Base at Alamogordo, New Mexico were used for aerodynamic studies. Both Navy and Air Force aircraft were made available for the development of the spacecraft's landing system, and Navy ships and Navy and Marine Corps helicopters were made available for recovery. [n 5] South of Cape Canaveral the town of Cocoa Beach boomed. From here, 75,000 people watched the first American orbital flight being launched in 1962. The Mercury spacecraft's principal designer was Maxime Faget, who started research for manned spaceflight during the time of the NACA. 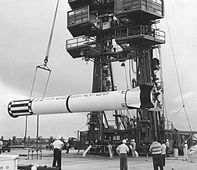 It was 10.8 feet (3.3 m) long and 6.0 feet (1.8 m) wide; with the launch escape system added, the overall length was 25.9 feet (7.9 m). With 100 cubic feet (2.8 m3) of habitable volume, the capsule was just large enough for a single crew member. Inside were 120 controls: 55 electrical switches, 30 fuses and 35 mechanical levers. The heaviest spacecraft, Mercury-Atlas 9, weighed 3,000 pounds (1,400 kg) fully loaded. Its outer skin was made of René 41, a nickel alloy able to withstand high temperatures. 1. Retropack. 2. Heatshield. 3. Crew compartment. 4. Recovery compartment. 5. Antenna section. 6. Launch escape system. The astronaut lay in a sitting position with his back to the heat shield, which was found to be the position that best enabled a human to withstand the high g-forces of launch and reentry. A fiberglass seat was custom-molded from each astronaut's space-suited body for maximum support. Near his left hand was a manual abort handle to activate the launch escape system if necessary prior to or during liftoff, in case the automatic trigger failed. To supplement the onboard environmental control system, he wore a pressure suit with its own oxygen supply, which would also cool him. A cabin atmosphere of pure oxygen at a low pressure of 5.5 psi (equivalent to an altitude of 24,800 feet (7,600 m)) was chosen, rather than one with the same composition as air (nitrogen/oxygen) at sea level. This was easier to control, avoided the risk of decompression sickness ("the bends"),[n 7] and also saved on spacecraft weight. Fires (which never occurred) would have to be extinguished by emptying the cabin of oxygen. In such case, or failure of the cabin pressure for any reason, the astronaut could make an emergency return to Earth, relying on his suit for survival. The astronauts normally flew with their visor up, which meant that the suit was not inflated. With the visor down and the suit inflated, the astronaut could only reach the side and bottom panels, where vital buttons and handles were placed. Once in orbit, the spacecraft could be rotated in yaw, pitch, and roll: Along its longitudinal axis (roll), left to right from the astronaut's point of view (yaw), and up or down (pitch). Movement was created by rocket-propelled thrusters which used hydrogen peroxide as a fuel. For orientation, the pilot could look through the window in front of him or he could look at a screen connected to a periscope with a camera which could be turned 360°. The Mercury astronauts had taken part in the development of their spacecraft, and insisted that manual control, and a window, be elements of its design. As a result, spacecraft movement and other functions could be controlled three ways: remotely from the ground when passing over a ground station, automatically guided by onboard instruments, or manually by the astronaut, who could replace or override the two other methods. Experience validated the astronauts' insistence on manual controls. Without them, Gordon Cooper's manual reentry during the last flight would not have been possible. 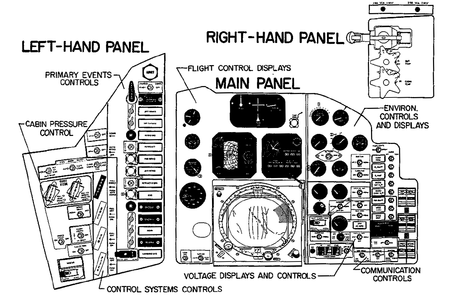 The control panels of Friendship 7. The panels changed between flights, among others the periscope screen that dominates the center of these panels was dropped for the final flight together with the periscope itself. The Mercury spacecraft design was modified three times by NASA between 1958 and 1959. After bidding by potential contractors had been completed, NASA selected the design submitted as "C" in November 1958. After it failed a test flight in July 1959, a final configuration, "D", emerged. 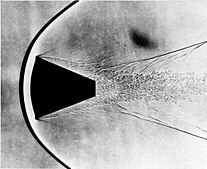 The heat shield shape had been developed earlier in the 1950s through experiments with ballistic missiles, which had shown a blunt profile would create a shock wave that would lead most of the heat around the spacecraft. To further protect against heat, either a heat sink, or an ablative material, could be added to the shield. The heat sink would remove heat by the flow of the air inside the shock wave, whereas the ablative heat shield would remove heat by a controlled evaporation of the ablative material. After unmanned tests, the latter was chosen for manned flights. Apart from the capsule design, a rocket plane similar to the existing X-15 was considered. This approach was still too far from being able to make a spaceflight, and was consequently dropped. [n 9] The heat shield and the stability of the spacecraft were tested in wind tunnels, and later in flight. The launch escape system was developed through unmanned flights. During a period of problems with development of the landing parachutes, alternative landing systems such as the Rogallo glider wing were considered, but ultimately scrapped. The spacecraft were produced at McDonnell Aircraft, St. Louis, Missouri in clean rooms and tested in vacuum chambers at the McDonnell plant. The spacecraft had close to 600 subcontractors, such as Garrett AiResearch which built the spacecraft's environmental control system. Final quality control and preparations of the spacecraft were made at Hangar S at Cape Canaveral. [n 10] NASA ordered 20 production spacecraft, numbered 1 through 20. Five of the 20, Nos. 10, 12, 15, 17, and 19, were not flown. Spacecraft No. 3 and No. 4 were destroyed during unmanned test flights. Spacecraft No. 11 sank and was recovered from the bottom of the Atlantic Ocean after 38 years. Some spacecraft were modified after initial production (refurbished after launch abort, modified for longer missions, etc.). 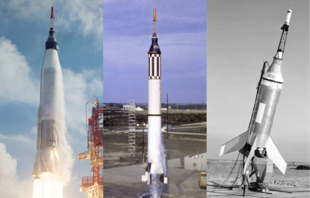 [n 11] A number of Mercury boilerplate spacecraft (made from non-flight materials or lacking production spacecraft systems) were also made by NASA and McDonnell. They were designed and used to test spacecraft recovery systems and the escape tower. McDonnell also built the spacecraft simulators used by the astronauts during training. Drop of boilerplate spacecraft in training of landing and recovery. 56 such qualification tests were made together with tests of individual steps of the system. 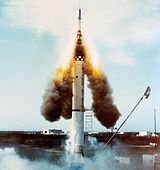 A small launch vehicle (55 feet (17 m) long) called Little Joe was used for unmanned tests of the launch escape system, using a Mercury capsule with an escape tower mounted on it. Its main purpose was to test the system at a point called max-q, at which air pressure against the spacecraft peaked, making separation of the launch vehicle and spacecraft most difficult. It was also the point at which the astronaut was subjected to the heaviest vibrations. The Little Joe rocket used solid-fuel propellant and was originally designed in 1958 by the NACA for suborbital manned flights, but was redesigned for Project Mercury to simulate an Atlas-D launch. It was produced by North American Aviation. It was not able to change direction; instead its flight depended on the angle from which it was launched. Its maximum altitude was 100 mi (160 km) fully loaded. A Scout launch vehicle was used for a single flight intended to evaluate the tracking network; however, it failed and was destroyed from the ground shortly after launch. The Mercury-Redstone Launch Vehicle, an 83-foot (25 m) tall (with capsule and escape system) single-stage launch vehicle used for suborbital (ballistic) flights. It had a liquid-fueled engine that burned alcohol and liquid oxygen producing about 75,000 pounds of thrust, which was not enough for orbital missions. It was a descendant of the German V-2, and developed for the U.S. Army during the early 1950s. It was modified for Project Mercury by removing the warhead and adding a collar for supporting the spacecraft together with material for damping vibrations during launch. Its rocket motor was produced by North American Aviation and its direction could be altered during flight by its fins. They worked in two ways: by directing the air around them, or by directing the thrust by their inner parts (or both at the same time). Both the Atlas-D and Redstone launch vehicles contained an automatic abort sensing system which allowed them to abort a launch by firing the launch escape system if something went wrong. The Jupiter rocket, also developed by Von Braun's team at the Redstone Arsenal in Huntsville, was considered as well for intermediate Mercury suborbital flights at a higher speed and altitude than Redstone, but this plan was dropped when it turned out that man-rating Jupiter for the Mercury program would actually cost more than flying an Atlas due to economics of scale. Jupiter's only use other than as a missile system was for the short-lived Juno II launch vehicle and keeping a full staff of technical personnel around solely to fly a few Mercury capsules would result in excessively high costs. Orbital missions required use of the Atlas LV-3B, a man-rated version of the Atlas D which was originally developed as the United States' first operational intercontinental ballistic missile (ICBM) by Convair for the Air Force during the mid-1950s. The Atlas was a "one-and-one-half-stage" rocket fueled by kerosene and liquid oxygen (LOX). The rocket by itself stood 67 feet (20 m) high; total height of the Atlas-Mercury space vehicle at launch was 95 feet (29 m). The Atlas first stage was a booster skirt with two engines burning liquid fuel. 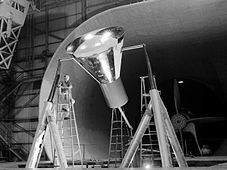 [n 12] This together with the larger sustainer second stage gave it sufficient power to launch a Mercury spacecraft into orbit. Both stages fired from lift-off with the thrust from the second stage sustainer engine passing through an opening in the first stage. After separation from the first stage, the sustainer stage continued alone. The sustainer also steered the rocket by thrusters guided by gyroscopes. Smaller vernier rockets were added on its sides for precise control of maneuvers. Shepard became the first American in space by making a suborbital flight in May 1961. He went on to fly in the Apollo program and became the only Mercury astronaut to walk on the Moon. Gus Grissom, who became the second American in space, also participated in the Gemini and Apollo programs, but died in January 1967 during a pre-launch test for Apollo 1. Glenn became the first American to orbit the Earth in February 1962, then quit NASA and went into politics, serving as a US Senator from 1974 to 1999, and returned to space in 1998 as a Payload Specialist aboard STS-95. Deke Slayton was grounded in 1962, but remained with NASA and was appointed Chief Astronaut at the beginning of Project Gemini. He remained in the position of senior astronaut, in charge of space crew flight assignments among many other responsibilities, until towards the end of Project Apollo, when he resigned and began training to fly on the Apollo-Soyuz Test Project in 1975, which he successfully did. Gordon Cooper became the last to fly in Mercury and made its longest flight, and also flew a Gemini mission. Carpenter's Mercury flight was his only trip into space. Schirra flew the third orbital Mercury mission, and then flew a Gemini mission. Three years later, he commanded the first manned Apollo mission, becoming the only person to fly in all three of those programs. One of the astronauts' tasks was publicity; they gave interviews to the press and visited project manufacturing facilities to speak with those who worked on Project Mercury. To make their travels easier, they requested and got jet fighters for personal use. The press was especially fond of John Glenn, who was considered the best speaker of the seven. They sold their personal stories to Life magazine which portrayed them as patriotic, God-fearing family men. Life was also allowed to be at home with the families while the astronauts were in space. During the project, Grissom, Carpenter, Cooper, Schirra and Slayton stayed with their families at or near Langley Air Force Base; Glenn lived at the base and visited his family in Washington DC on weekends. Shepard lived with his family at Naval Air Station Oceana in Virginia. Other than Grissom, who was killed in the 1967 Apollo 1 fire, the other six survived past retirement and died between 1993 and 2016. Mercury 7 astronaut assignments. Schirra had the most flights with three; Glenn, though being the first to leave NASA, had the last with a Space Shuttle mission in 1998. Shepard was the only one to walk on the Moon. Prior to Project Mercury, there was no protocol for selecting astronauts so NASA would set a far reaching precedent with both their selection process and initial choices for astronaut. 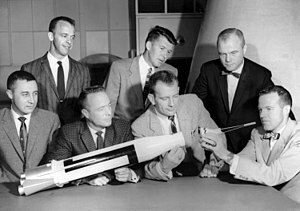 At the end of 1958, various ideas for the selection pool were discussed privately within the national government and the civilian space program, and also among the public at large. Initially, there was the idea to issue a widespread public call to volunteers. Thrill seekers such as rock climbers and acrobats would have been allowed to apply but this idea was quickly shot down by NASA officials who understood that an undertaking such as space flight required individuals with professional training and education in flight engineering. By late 1958, NASA officials decided to move forward with test pilots being the heart of their selection pool. On President Eisenhower's insistence, the group was further narrowed down to active duty military test pilots, which set the number of candidates at 508 men. who were either USN or USMC naval aviation pilots (NAPs), or USAF pilots of Senior or Command rating. These men had long military records which would give NASA officials more background information to base their decisions on. Furthermore, these men were adept at flying the most advanced aircraft to date, giving them the best qualifications for the new position of astronaut. However, this selection excluded women since there were no female military test pilots at the time. It also excluded civilian NASA X-15 pilot Neil Armstrong, though he had been selected by the US Air Force in 1958 for its Man in Space Soonest program, which was replaced by Mercury. Although Armstrong had been a combat-experienced NAP during the Korean War, he left active duty in 1952. [n 13] Armstrong became NASA's first civilian astronaut in 1962 when he was selected for NASA's second group, and became the first man on the Moon in 1969. It was further stipulated that candidates should be between 25 and 40 years old, no taller than 5 ft 11 in (1.80 m), and hold a college degree in a STEM subject. The college degree requirement excluded the USAF's X-1 pilot, then-Lt Col (later Brig Gen) Chuck Yeager, the first person to exceed the speed of sound. He later became a critic of the project, ridiculing the civilian space program, labeling astronauts as "spam in a can." John Glenn did not have a college degree either, but used influential friends to make the selection committee accept him. USAF Capt (later Col) Joseph Kittinger, a USAF fighter pilot and stratosphere balloonist, met all the requirements but preferred to stay in his contemporary project. Other potential candidates declined because they did not believe that manned spaceflight had a future beyond Project Mercury. [n 14] From the original 508, 110 candidates were selected for an interview, and from the interviews, 32 were selected for further physical and mental testing. Their health, vision, and hearing were examined, together with their tolerance to noise, vibrations, g-forces, personal isolation, and heat. In a special chamber, they were tested to see if they could perform their tasks under confusing conditions. The candidates had to answer more than 500 questions about themselves and describe what they saw in different images. Navy Lt (later Capt) Jim Lovell, who was later an astronaut in the Gemini and Apollo programs, did not pass the physical tests. After these tests it was intended to narrow the group down to six astronauts, but in the end it was decided to keep seven. The astronauts went through a training program covering some of the same exercises that were used in their selection. 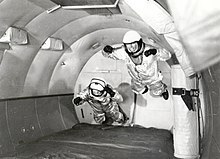 They simulated the g-force profiles of launch and reentry in a centrifuge at the Naval Air Development Center, and were taught special breathing techniques necessary when subjected to more than 6 g. Weightlessness training took place in aircraft, first on the rear seat of a two-seater fighter and later inside converted and padded cargo aircraft. They practiced gaining control of a spinning spacecraft in a machine at the Lewis Flight Propulsion Laboratory called the Multi-Axis Spin-Test Inertia Facility (MASTIF), by using an attitude controller handle simulating the one in the spacecraft. A further measure for finding the right attitude in orbit was star and Earth recognition training in planetaria and simulators. Communication and flight procedures were practiced in flight simulators, first together with a single person assisting them and later with the Mission Control Center. Recovery was practiced in pools at Langley, and later at sea with frogmen and helicopter crews. Profile. See timetable for explanation. Dashed line: region of weightlessness. A Redstone rocket was used to boost the capsule for 2 minutes and 30 seconds to an altitude of 32 nautical miles (59 km); the capsule continued ascending on a ballistic curve after booster separation. The launch escape system was jettisoned at the same time. At the top of the curve, the spacecraft's retrorockets were fired for testing purposes; they were not necessary for reentry because orbital speed had not been attained. The spacecraft landed in the Atlantic Ocean. The suborbital mission took about 15 minutes, had an apogee altitude of 102–103 nautical miles (189–191 km), and a downrange distance of 262 nautical miles (485 km). 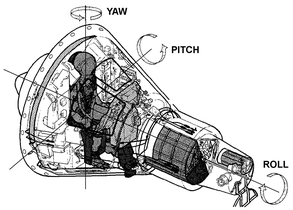 From the time of booster-spacecraft separation until reentry where air started to slow down the spacecraft, the pilot would experience weightlessness as shown on the image. [n 15] The recovery procedure would be the same as an orbital mission. Launch Complex 14 just before launch (service tower rolled aside). Preparations for launch were made in the blockhouse. Once in orbit, it was not possible for the spacecraft to change its trajectory except by initiating reentry. Each orbit would typically take 88 minutes to complete. The lowest point of the orbit, called perigee, was at about 87 nautical miles (161 km) altitude, and the highest point, called apogee, was about 150 nautical miles (280 km) altitude. 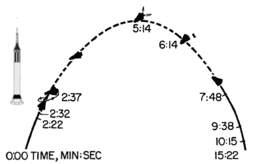 When leaving orbit (E), the angle of retrofire was 34° downward from the flight path angle. Retrorockets fired for 10 seconds each (F) in a sequence where one started 5 seconds after the other. 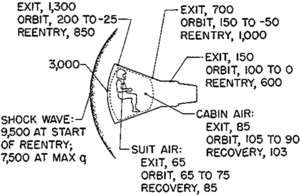 During reentry (G), the astronaut would experience about 8 g (11–12 g on a suborbital mission). The temperature around the heat shield rose to 3,000 °F (1,600 °C) and at the same time, there was a two-minute radio blackout due to ionization of the air around the spacecraft. The number of personnel supporting a Mercury mission was typically around 18,000, with about 15,000 people associated with recovery. 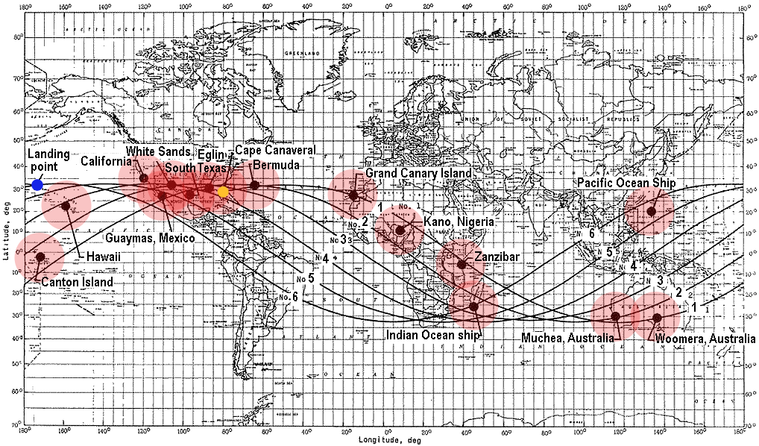 [n 25] Most of the others followed the spacecraft from the World Wide Tracking Network, a chain of 18 stations placed around the equator, which was based on a network used for satellites and made ready in 1960. It collected data from the spacecraft and provided two-way communication between the astronaut and the ground. Each station had a range of 700 nautical miles (1,300 km) and a pass typically lasted 7 minutes. Mercury astronauts on the ground would take part of the Capsule Communicator or CAPCOM who communicated with the astronaut in orbit. [n 26] Data from the spacecraft was sent to the ground, processed at the Goddard Space Center and relayed to the Mercury Control Center at Cape Canaveral. In the Control Center, the data was displayed on boards on each side of a world map, which showed the position of the spacecraft, its ground track and the place it could land in an emergency within the next 30 minutes. 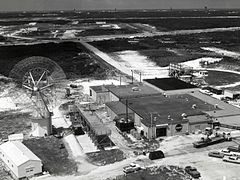 The World Wide Tracking Network went on to serve subsequent space programs, until it was replaced by a satellite relay system in the 1980s Mission Control Center was moved from Cape Canaveral to Houston in 1965. Ground track and tracking stations for Mercury-Atlas 8. Spacecraft starts from Cape Canaveral in Florida and moves east; each new orbit-track is displaced to the left due to the rotation of the Earth. It moves between latitudes 32.5° north and 32.5° south. Key: 1–6: orbit number. Yellow: launch. Black dot: tracking station. Red: range of station; Blue: landing. On April 12, 1961 the Soviet cosmonaut Yuri Gagarin became the first person in space on an orbital flight. Alan Shepard became the first American in space on a suborbital flight three weeks later, on May 5, 1961. John Glenn, the third Mercury astronaut to fly, became the first American to reach orbit on February 20, 1962, but only after the Soviets had launched a second cosmonaut, Gherman Titov, into a day-long flight in August 1961. Three more Mercury orbital flights were made, ending on May 16, 1963 with a day-long, 22 orbit flight. However, the Soviet Union ended its Vostok program the next month, with the human spaceflight endurance record set by the 82-orbit, almost 5-day Vostok 5 flight. Mercury-Redstone 3 First American in space. Recovered by carrier USS Lake Champlain. 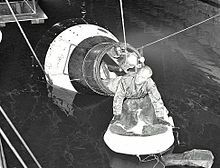 Mercury-Redstone 4 Spacecraft sank during recovery when hatch unexpectedly blew off. [n 28] Astronaut recovered by carrier USS Randolph. Mercury-Atlas 6 First American in orbit. Retropack retained during reentry. [n 29] Recovered by destroyer USS Noa. Mercury-Atlas 8 The flight closest to plan. Carried out maneuvering tests. Recovered by carrier USS Kearsarge. Mercury-Atlas 9 First American in space for over a day. Last American solo mission. [n 32] Recovered by USS Kearsarge. Recovery variations MA6) spacecraft and astronaut hoist onboard directly; MA8) spacecraft and astronaut towed by boat to ship; MA9) spacecraft with astronaut inside flown to ship. Shepard's flight watched on TV in the White House. May 1961. John Glenn honored by the President. February 1962. 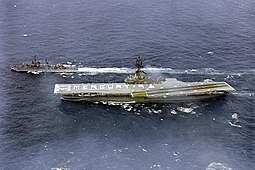 USS Kearsarge with crew spelling Mercury-9. May 1963. The 20 unmanned flights used Little Joe, Redstone, and Atlas launch vehicles. They were used to develop the launch vehicles, launch escape system, spacecraft and tracking network. One flight of a Scout rocket attempted to launch an unmanned satellite for testing the ground tracking network, but failed to reach orbit. The Little Joe program used seven airframes for eight flights, of which three were successful. The second Little Joe flight was named Little Joe 6, because it was inserted into the program after the first 5 airframes had been allocated. Little Joe 1 Due to an electrical malfunction, the escape tower ignited ½ hour before launch and took the spacecraft with it, leaving the rocket on the ground. Big Joe 1 Actually the first Mercury-Atlas flight. Recovered by USS Strong 2,407 km SE of Cape Canaveral. Altitude: 65 mi (105 km) Qualified ablative heatshield. Little Joe 1A The rescue tower rocket ignited 10 seconds too late. Recovered by USS Opportune 11.5 mi (18.5 km) SE of Wallops Island. Little Joe 2 Carried Sam, a rhesus macaque. Recovered by USS Borie 194 mi (312 km) SE of Wallops Island, Virginia; altitude: 53 mi (85 km). Little Joe 1B Carried a female rhesus monkey named Miss Sam. Beach Abort A boilerplate spacecraft was lifted from the ground by the launch escape system alone at Wallops Island. It reached an apogee of 0.751 kilometres (2,465 ft) and was recovered after landing. Top velocity: 436 metres per second (976 mph). Total payload: 1,154 kg. Mercury-Atlas 1 Exploded while passing through max-q To save weight, the airframe had been made thinner since Big Joe, which led to a collapse. The next Atlas was strengthened by a temporary solution while the rest were made from the same specifications as Big Joe. Mercury-Atlas 2 Recovered by USS Donner 1,432 mi (2,305 km) SE of Cape Canaveral. Little Joe 5A Tower fired 14 seconds too soon; it failed to separate the spacecraft from the rocket. Mercury-Atlas 3 Upgraded from suborbital flight. Was aborted when it did not go into orbit; boiler plate capsule recovered and reused in Mercury-Atlas 4. Little Joe 5B Concluded Little Joe program. Mercury-Atlas 4 Completed one orbit and sent data to the ground; first orbital flight of the project. Recovery by USS Decatur 176 mi (283 km) east of Bermuda. Mercury-Scout 1 Was aborted after malfunction of guidance system; results of Mercury-Atlas 4 and Mercury-Atlas 5 were used instead. 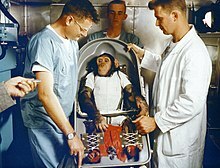 Mercury-Atlas 5 Chimpanzee Enos completed a two-orbit flight, performing tasks to prove it possible for a person to function during a flight. [n 37] Last Mercury-Atlas test flight. Recovery by USS Stormes 255 mi (410 km) SE of Bermuda. Nine of the planned flights were canceled. Suborbital flights were planned for four other astronauts but the number of flights was cut down gradually and finally all remaining were canceled after Titov's flight. 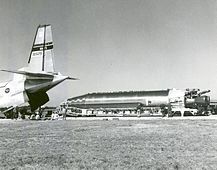 [n 38] Mercury-Atlas 9 was intended to be followed by more one-day flights and even a three-day flight but with the coming of the Gemini Project it seemed unnecessary. The Jupiter booster was, as mentioned above, intended to be used for different purposes. During the 1950s, some experts doubted that manned spaceflight was possible. 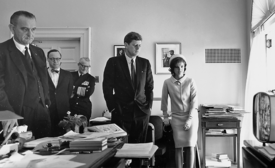 [n 42] Still when John F. Kennedy was elected president, many including he had doubts about the project. As president he chose to support the programs a few months before the launch of Freedom 7, which became a public success. [n 43] Afterwards, a majority of the American public supported manned spaceflight, and within a few weeks, Kennedy announced a plan for a manned mission to land on the Moon and return safely to Earth before the end of the 1960s. The six astronauts who flew were awarded medals, driven in parades and two of them were invited to address a joint session of the US Congress. As a response to the selection criteria, which ruled out women, a private project was founded in which 13 women pilots successfully underwent the same tests as the men in Project Mercury. It was named Mercury 13 by the media[n 44] Despite this effort, NASA did not select female astronauts until 1978 for the Space Shuttle. John Glenn documentary from 50th Anniversary of Friendship 7, 2012. ^ The project was delayed by 22 months, counting from the beginning until the first orbital mission. It had a dozen prime contractors, 75 major subcontractors, and about 7200 third-tier subcontractors. The cost estimate made by NASA in 1969 was $392.6 million, broken down as follows: Spacecraft: $135.3 million, launch vehicles: $82.9 million, operations: $49.3 million, tracking operations and equipment: $71.9 million and facilities: $53.2 million. ^ Man in Space Soonest was the first part of a four-phase Moon landing program estimated to finish in 1965, cost a total of $1.5 billion ($12.9 billion adjusted for inflation), and be launched by a "Super Titan" rocket. ^ The name Little Joe was adopted by its designers from the throw of a double deuce in a craps game since this resembled the four-rocket arrangement in the blueprints for the vehicle. ^ NASA's planning for recovery operations in the summer of 1960 was, according to the Navy, asking for the deployment of the whole Atlantic Fleet and might have cost more than the entire Mercury program. ^ The decision to eliminate the use of any gas but oxygen was crystalized when a serious accident occurred on April 21, 1960, in which McDonnell Aircraft test pilot G.B. North passed out and was seriously injured when testing a Mercury cabin/spacesuit atmosphere system in a vacuum chamber. The problem was found to be nitrogen-rich (oxygen-poor) air leaking from the cabin into his spacesuit feed. ^ Moisture and urine was reclycled into drinking water. ^ The rocket plane approach to manned space flight was pursued by the Air Force with their Dyna-Soar project, which was canceled in 1963 Toward the end of the 1960s, NASA began the development of a reusable space plane, which was ultimately developed into the Space Shuttle program. The first rocket plane to enter space was an X-15 in 1963. ^ Test and rework of Mercury-Redstone 2 at the Hangar required 110 days. Hangar S was also the place where the chimpanzees were trained. ^ They received a letter designation after their number, examples 2B, 15B. Some were modified twice; for example, spacecraft 15 became 15A and then 15B. ^ At the time word booster was sometimes used for the first stage of the launch stack. Later the word booster came to refer to additional single-stage rockets attached to the sides of the main launch vehicle, as in Space Shuttle boosters. ^ Armstrong left the Navy as a Lieutenant, Junior Grade in the US Naval Reserve, until resigning his commission 1960. ^ At the beginning of the project both President Eisenhower and NASA's first administrator T. K. Glennan believed that US would put the first man in space, and that this would be the end of the Space Race. ^ With the exception of the 20 seconds of retrofire during which the pilot would experience g-force. ^ Inside the spacecraft the other astronauts had usually prepared a practical joke, such as a sign saying "No handball playing". ^ Countdown was controlled from the blockhouse at the Launch Complex until 2 min. before launch then it was transferred to Mission Control Center. The countdown of the last 10 sec. before launch would be given to the astronaut by one of the others and included on TV transmissions which had already started. 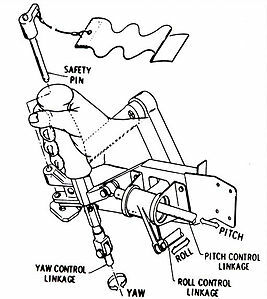 ^ In the event of a launch abort before this point, the launch escape system would fire its main rocket for one second, pulling the spacecraft and astronaut away from the launch vehicle and a possible explosion. At this point, the spacecraft could be separated from the launch vehicle and land using its parachute. ^ The direction of insertion was east and slightly to the north, this meant that on at three orbit flight the tracking network was used best possible and a landing could take place in the North Atlantic Ocean. ^ The sustainer would disintegrate and fall down; after the launch of Friendship 7 a part of the sustainer was found in South Africa. ^ The capsule's tendency to drift was countered automatically by the attitude control system (ASCS) which used small hydrogen peroxide thrusters. To save fuel, however, the spacecraft would be allowed to drift from time to time, especially on longer missions. ^ Radar chaff and a SOFAR bomb which could be detected by the recovery ship's hydrophone were eliminated as unnecessary measures after the first orbital flight. ^ The collar was not ready for suborbital missions. 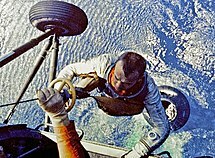 ^ It was also possible to exit the capsule through the nose cylinder; only Carpenter did this. ^ Occasionally this communication was broadcast on live TV while the spacecraft was passing over the United States. ^ Alexander & al., 1966, pp. 638–641. ^ It was recovered in 1999. ^ Launch of Friendship 7 was postponed repeatedly during two months; a frustrated politician compared the spacecraft-Atlas combination to "a Rube Goldberg device on top of a plumber's nightmare". ^ During Carpenter's mission a seaplane from the US Air Force got to the landing site about 1½ hour ahead of the Navy ships and offered to pick him up. This, however, was declined by the admiral in charge of Mercury recovery operations, which led to a Senate hearing about the incident. ^ Likely to be so according to Alexander & al. ^ Source: Alexander & al., 1966, pp. 638–641 when nothing else is mentioned. ^ A machine that produced the same heat, vapor and CO2 as an astronaut. ^ The clamp was subsequently tested by a rocket sled. ^ Immediately after the Redstone's engine shut down, the capsule's escape rocket jettisoned itself, leaving the capsule attached to the booster. The escape rocket rose to an altitude of 4,000 ft (1,200 m) and landed about 400 yd (370 m) away. 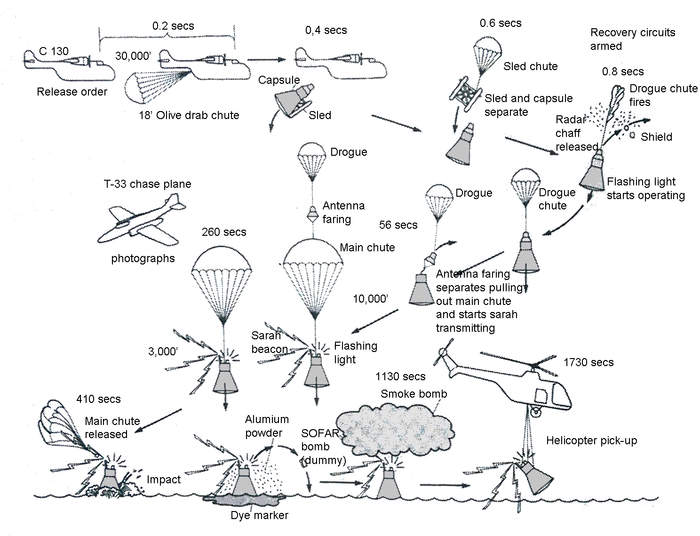 Three seconds after the escape rocket fired, the capsule deployed its drogue parachute; it then deployed the main and reserve parachutes. ^ Was given a reward in the form a banana pellet or a punishment in the form of mild electrical shocks depending on whether or not he gave the right response to a given signal; by mistake he was sometimes given shocks on right answers. 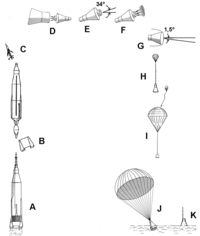 ^ Within the Mercury Project organization the suborbital flights were from the start criticized as being of little value and even compared to a circus act. ^ Proposed maximum dynamic pressure test for capsule. ^ Mercury-Atlas 10 was intended to be a three-day mission in November 1962 with extra supplies attached to the heat shield. Call-sign Freedom 7-II. 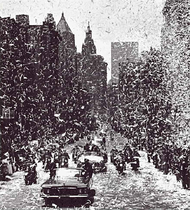 By January 1963, it was changed to a one-day back up mission for Mercury-Atlas 9. It was canceled after the success of the latter. ^ International rules required that a pilot must land safely with the spacecraft; in reality, Gagarin landed separately by parachute; however, the Soviet Union did not admit this until 1971 when their claim was no longer in danger of being challenged. ^ In May 1957, five months before Sputnik I, the president of McDonnell, the later prime contractor, predicted that manned spaceflight would not take place before 1990. ^ Along the roads in the US, drivers stopped to follow Freedom 7 on the radio. Later, 100 millions saw or listened to Friendship 7, the first orbital flight, on TV or radio. The launch of Sigma 7 and Faith 7 were relayed live via communication satellite to television audiences in Western Europe. Two of the three major US networks covered Sigma 7-minute-by-minute, the rest were showing the opening of the World Series. ^ It gave Soviet leader Khrushchev the idea of launching the first women cosmonaut Valentina Tereshkova on 16 June 1963. ^ The stamp first went on sale in Cape Canaveral, Florida on February 20, 1962, the same day as the first manned orbital flight. On May 4, 2011, the Postal Service released a stamp commemorating the 50th anniversary of Freedom 7, the first manned flight of the project. ^ Boeing received the award in recognition of Project Mercury's pioneering "navigation and control instruments, autopilot, rate stabilization and control, and fly-by-wire systems." ^ The stamp was issued February 20, 1962, the day of John Glenn's flight in Friendship 7. This one has a First day of issue postmark from Cape Canaveral post office. ^ The only patches the Mercury astronauts wore, were the NASA logo and a name tag. Each manned Mercury spacecraft was painted black and decorated with a flight insignia, its call-sign, an American flag and the words United States. ^ a b Lafleur, Claude (March 8, 2010). "Costs of US piloted programs". The Space Review. Retrieved February 18, 2012. ^ a b c d Alexander & al. 1966, p. 508. ^ Wilford 1969, p. 67. ^ Alexander & al. 1966, p. 643. ^ Grimwood 1963, p. 12. ^ a b Alexander & al. 1966, p. 132. ^ a b c d Catchpole 2001, p. 92. ^ Alexander & al. 1966, p. 102. ^ Alexander & al. 1966, p. 91. ^ Catchpole 2001, pp. 12–14. ^ a b Catchpole 2001, p. 81. ^ Alexander & al. 1966, pp. 28, 52. ^ Catchpole 2001, p. 55. ^ Alexander & al. 1966, p. 113. ^ Catchpole 2001, pp. 57, 82. ^ Catchpole 2001, p. 70. ^ Alexander & al. 1966, p. 13. ^ Alexander & al. 1966, p. 44. ^ Alexander & al. 1966, p. 59. ^ Catchpole 2001, p. 466. ^ a b Alexander & al. 1966, p. 357. ^ Alexander & al. 1966, pp. 35, 39–40. ^ Alexander & al. 1966, p. 49. ^ Alexander & al. 1966, pp. 37–38. ^ a b Alexander & al. 1966, p. 61. ^ Alexander & al. 1966, pp. 98–99. ^ Catchpole 2001, p. 82. ^ Alexander & al. 1966, pp. xiii, 134. ^ a b Alexander & al. 1966, p. 134. ^ a b Alexander & al. 1966, p. 143. ^ Catchpole 2001, p. 157. ^ Alexander & al. 1966, pp. 121, 191. ^ a b c Alexander & al. 1966, p. 137. ^ a b Alexander & al. 1966, p. 124. ^ Alexander & al. 1966, p. 216. ^ a b c Alexander & al. 1966, p. 21. ^ Catchpole 2001, p. 158. ^ Catchpole 2001, p. 89–90. ^ Catchpole 2001, p. 86. ^ Alexander & al. 1966, p. 141. ^ a b Catchpole 2001, pp. 103–110. ^ a b Alexander & al. 1966, p. 88. ^ a b c Catchpole 2001, p. 248. ^ Catchpole 2001, pp. 172–173. ^ Alexander & al. 1966, p. 265. ^ a b "History-At-A-Glance". City of Cocoa Beach. Archived from the original on January 4, 2013. Retrieved June 24, 2013. ^ Catchpole 2001, p. 150. ^ a b Catchpole 2001, p. 131. ^ a b Alexander & al. 1966, p. 47. ^ Alexander & al. 1966, p. 245. ^ Alexander & al. 1966, p. 490. ^ Catchpole 2001, p. 136. ^ Catchpole 2001, pp. 134–136. ^ Alexander & al. 1966, pp. 140, 143. ^ Catchpole 2001, pp. 132–134. ^ a b c d Catchpole 2001, p. 132. ^ Alexander & al. 1966, p. 188. ^ a b Catchpole 2001, p. 134. ^ Catchpole 2001, pp. 136–144. ^ Catchpole 2001, pp. 136–137. ^ a b Catchpole 2001, p. 138. ^ a b c d Catchpole 2001, p. 139. ^ Alexander & al. 1966, p. 368. ^ a b Catchpole 2001, pp. 144–145. ^ a b c d Catchpole 2001, p. 144. ^ Catchpole 2001, p. 135. ^ Catchpole 2001, pp. 145–148. ^ a b c Catchpole 2001, p. 147. ^ Alexander & al. 1966, p. 199. ^ Catchpole 2001, pp. 179–181. ^ a b Catchpole 2001, p. 179. ^ a b NASA. "Computers in Spaceflight: The NASA Experience – Chapter One: The Gemini Digital Computer: First Machine in Orbit". NASA History. NASA. Retrieved September 15, 2016. ^ Rutter, Daniel (October 28, 2004). "Computers in space". Dan's Data. Retrieved September 15, 2016. ^ "Space flight chronology". IBM Archives. IBM. Retrieved September 15, 2016. ^ "IBM 701 – A notable first: The IBM 701". IBM Archives. IBM. Retrieved September 15, 2016. ^ Catchpole 2001, p. 142. ^ a b Catchpole 2001, p. 191. ^ Gatland 1976, p. 264. ^ Catchpole 2001, p. 410. ^ a b Giblin 1998. ^ Alexander & al. 1966, pp. 48–49. ^ Alexander & al. 1966, p. 246. ^ Catchpole 2001, pp. 191, 194. ^ Catchpole 2001, pp. 343–344. ^ Agle, D.C. (September 1998). "Flying the Gusmobile". Air & Space. Retrieved December 15, 2018. ^ Catchpole 2001, pp. 142–143. ^ Alexander & al. 1966, p. 499. ^ Catchpole 2001, p. 143. ^ Catchpole 2001, p. 141. ^ Catchpole 2001, pp. 98–99. ^ a b Alexander & al. 1966, p. 501. ^ Unknown 1962, p. 8. ^ Catchpole 2001, p. 152. ^ Catchpole 2001, p. 153. ^ Catchpole 2001, p. 159. ^ Catchpole 2001, p. 149. ^ Alexander & al. 1966, p. 63. ^ Alexander & al. 1966, p. 64. ^ Alexander & al. 1966, p. 206. ^ Alexander & al. 1966, pp. 78–80. ^ Alexander & al. 1966, p. 72. ^ Catchpole 2001, pp. 425, 428. ^ "Introduction to future launch vehicle plans [1963–2001]. 3.The Space Shuttle (1968–72)". Retrieved February 3, 2014. ^ Garber, Steve. "X – 15 Hypersonic Research at the Edge of Space". NASA History Homepage. NASA. Retrieved July 18, 2015. ^ a b Catchpole 2001, p. 229. ^ a b Catchpole 2001, p. 196. ^ Alexander & al. 1966, p. 198. ^ Catchpole 2001, pp. 132, 159. ^ Catchpole 2001, pp. 184–188. ^ a b Alexander & al. 1966, p. 310. ^ Alexander & al. 1966, p. 312. ^ a b c Grimwood 1963, pp. 235–238. ^ a b Catchpole 2001, pp. 402–405. ^ Grimwood 1963, pp. 216–218. ^ Grimwood 1963, p. 149. ^ Alexander & al. 1966, pp. 126 & 138. ^ Alexander & al. 1966, pp. 96, 105. ^ Catchpole 2001, p. 107. ^ Catchpole 2001, pp. 172-173. ^ a b Catchpole 2001, p. 197. ^ Alexander & al. 1966, p. 638. ^ Catchpole 2001, p. 223. ^ Catchpole 2001, p. 284. ^ Catchpole 2001, p. 198. ^ Alexander & al. 1966, p. 125. ^ Alexander & al. 1966, pp. 392–397. ^ a b Catchpole 2001, p. 206. ^ Catchpole 2001, p. 207. ^ Catchpole 2001, pp. 209, 214. ^ Alexander & al. 1966, p. 151. ^ Grimwood 1963, p. 69. ^ a b c d Catchpole 2001, p. 211. ^ Alexander & al. 1966, p. 22. ^ Catchpole 2001, p. 212. ^ Catchpole 2001, pp. 225, 250. ^ Catchpole 2001, pp. 458–459. ^ Alexander & al. 1966, p. 164. ^ a b c d Alexander & al. 1966, p. 640. ^ a b c Alexander & al. 1966, p. 341. ^ Catchpole 2001, p. 445. ^ Catchpole 2001, p. 442. ^ Catchpole 2001, pp. 440,441. ^ Catchpole 2001, pp. 446–447. ^ a b c d Alexander & al. 1966, pp. 640–641. ^ Catchpole 2001, p. 99. ^ a b Catchpole 2001, p. 104. ^ Catchpole 2001, p. 96. ^ a b Catchpole 2001, p. 100. ^ Catchpole 2001, p. 97. ^ Australian Broadcasting Corporation (February 15, 2008). "Moment in Time – Episode 1". Retrieved June 25, 2013. ^ a b Dunbar, Brian. "Project Mercury Overview – Astronaut Selection". nasa.gov. NASA. Retrieved April 24, 2018. ^ Alexander & al. 1966, pp. 160–161. ^ Hansen 2005, p. 118. ^ a b c d Catchpole 2001, pp. 92–93. ^ Cloer, Dan. "Alan B. Shepard, Jr.: Spam in a Can?". vision.org. Vision. Retrieved April 24, 2018. ^ Catchpole 2001, p. 440. ^ Catchpole 2001, p. 407. ^ Catchpole 2001, p. 93. ^ a b c Catchpole 2001, p. 98. ^ Minard, D. (1964). Work Physiology. Archives of Environmental Health. 8(3): 427–436. ^ Catchpole 2001, p. 94. ^ Catchpole 2001, p. 105. ^ "Gimbal Rig Mercury Astronaut Trainer". NASA. June 9, 2008. Retrieved December 13, 2014. ^ Catchpole 2001, pp. 105, 109. ^ Catchpole 2001, p. 111. ^ Alexander & al. 1966, p. 346. ^ Unknown 1961a, p. 7. ^ Catchpole 2001, pp. 208, 250. ^ Catchpole 2001, pp. 250, 308. ^ a b Catchpole 2001, p. 475. ^ Catchpole 2001, p. 110. ^ a b c Catchpole 2001, p. 278. ^ Catchpole 2001, p. 280. ^ a b c Catchpole 2001, p. 188. ^ a b c Catchpole 2001, p. 281. ^ Catchpole 2001, p. 282. ^ Catchpole 2001, pp. 188, 242. ^ a b Catchpole 2001, p. 340. ^ Catchpole 2001, p. 180. ^ Unknown 1962, p. 46. ^ Catchpole 2001, pp. 188, 460. ^ Alexander & al. 1966, p. 215. ^ a b Catchpole 2001, p. 133. ^ Grimwood 1963, p. 164. ^ Unknown 1961, p. 10. ^ a b Alexander & al. 1966, p. 333. ^ a b Catchpole 2001, p. 120. ^ Alexander & al. 1966, pp. 195, 450. ^ Catchpole 2001, p. 462. ^ Catchpole 2001, p. 324. ^ Unknown 1961, p. 9. ^ Alexander & al. 1966, p. 574. ^ Unknown 1962, p. 9. ^ a b Alexander & al. 1966, p. 356. ^ Alexander & al. 1966, p. 445. ^ a b Catchpole 2001, p. 166. ^ Unknown 1962, p. 3. ^ Catchpole 2001, pp. 124, 461–462. ^ Catchpole 2001, p. 117. ^ Catchpole 2001, pp. 121, 126. ^ Alexander & al. 1966, p. 360. ^ Alexander & al. 1966, p. 479. ^ Catchpole 2001, p. 118. ^ Catchpole 2001, p. 409. ^ Catchpole 2001, p. 88. ^ Catchpole 2001, p. 128. ^ Alexander & al. 1966, p. 332. ^ Alexander & al. 1966, pp. 377, 422. ^ Catchpole 2001, p. 476. ^ a b Alexander & al. 1966, pp. 638–641. ^ Alexander & al. 1966, p. 373. ^ Alexander & al. 1966, p. 375. ^ Alexander & al. 1966, p. 422. ^ Alexander & al. 1966, p. 432. ^ Alexander & al. 1966, p. 409, 411. ^ Alexander & al. 1966, p. 433. ^ Alexander & al. 1966, p. 440. ^ Alexander & al. 1966, p. 453-454. ^ Alexander & al. 1966, p. 456. ^ Alexander & al. 1966, p. 457. ^ Alexander & al. 1966, p. 484. ^ Alexander & al. 1966, p. 476. ^ Alexander & al. 1966, p. 483. ^ Alexander & al. 1966, p. 487. ^ a b Alexander & al. 1966, p. 506. ^ Alexander & al. 1966, pp. 353,375,433,457,483–484,501. ^ Catchpole 2001, p. 231. ^ Alexander & al. 1966, p. 335. ^ Catchpole 2001, p. 275. ^ Catchpole 2001, p. 309. ^ Alexander & al. 1966, p. 208. ^ Alexander & al. 1966, pp. 203–204. ^ Alexander & al. 1966, p. 209. ^ a b Alexander & al. 1966, p. 210. ^ Catchpole 2001, p. 232. ^ Catchpole 2001, pp. 234, 474. ^ Alexander & al. 1966, p. 212. ^ Alexander & al. 1966, p. 276. ^ Catchpole 2001, p. 243. ^ Alexander & al. 1966, p. 291. ^ Alexander & al. 1966, p. 298. ^ a b Alexander & al. 1966, p. 294. ^ Alexander & al. 1966, p. 297. ^ Alexander & al. 1966, p. 316. ^ Alexander & al. 1966, pp. 638–639. ^ Alexander & al. 1966, pp. 321–322. ^ Alexander & al. 1966, p. 327. ^ Alexander & al. 1966, p. 330. ^ Alexander & al. 1966, p. 337. ^ Alexander & al. 1966, p. 386-387. ^ Alexander & al. 1966, p. 389. ^ Alexander & al. 1966, p. 397. ^ Catchpole 2001, p. 312. ^ Alexander & al. 1966, p. 404. ^ Alexander & al. 1966, p. 405. ^ Alexander & al. 1966, p. 406. ^ Grimwood 1963, p. 169. ^ Alexander & al. 1966, p. 377. ^ a b c d e Catchpole 2001, p. 474. ^ Alexander & al. 1966, p. 100. ^ a b Grimwood 1963, p. 81. ^ "Mercury-Jupiter 2 (MJ-2)". Astronautix.com. Archived from the original on June 17, 2012. Retrieved May 24, 2012. ^ Cassutt & Slayton 1994, p. 104. ^ Cassutt & Slayton 1994, p. 101. ^ Catchpole 2001, pp. 385–386. ^ "Mercury MA-11". Encyclopedia Astronauticax. Archived from the original on August 23, 2013. Retrieved June 22, 2013. ^ "Mercury MA-12". Encyclopedia Astronautica. Archived from the original on August 23, 2013. Retrieved June 22, 2013. ^ Catchpole 2001, p. cover. ^ Catchpole 2001, p. 417. ^ Siddiqi 2000, p. 283. ^ Alexander & al. 1966, p. 119. ^ Alexander & al. 1966, p. 272. ^ Alexander & al. 1966, p. 306. ^ Alexander & al. 1966, p. 434. ^ Alexander & al. 1966, p. 423. ^ "Mercury Atlas 8". NASA. Retrieved June 22, 2013. ^ Alexander & al. 1966, p. 472. ^ Alexander & al. 1966, p. 363. ^ Alexander & al. 1966, pp. 362, 435, 459, 486, 502, 584. ^ Alexander & al. 1966, pp. 435, 501. ^ Catchpole 2001, p. 447. ^ Catchpole 2001, pp. 447–448. ^ Catchpole 2001, p. 448. ^ "Mercury Monument Dedication at Launch Complex 14". Kennedy Space Center. Archived from the original on January 17, 2005. Retrieved June 29, 2013. ^ a b "Mystic stamp company". Retrieved April 1, 2012. ^ "Stamps Mark Shepard's 1961 Flight". US Postal Service. Retrieved May 5, 2011. ^ "The Right Stuff". IMdB. Retrieved October 4, 2011. ^ a b "Boeing Press Release". Retrieved February 25, 2011. ^ Alexander & al. 1966, p. 436. ^ a b Dorr, Eugene. "History of Patches". Retrieved June 20, 2013. Alexander, C. C.; Grimwood, J. M.; Swenson, L. S. (1966). This New Ocean: a History of Project Mercury (PDF). US: NASA. ISBN 1934941875. Cassutt, Michael; Slayton, Donald K. "Deke" (1994). Deke! U.S. Manned Space: From Mercury to the Shuttle (1st ed.). New York, US: Forge (St. Martin's Press). ISBN 0-312-85503-6. Catchpole, John (2001). Project Mercury - NASA's First Manned Space Programme. Chichester, UK: Springer Praxis. ISBN 1-85233-406-1. Gatland, Kenneth (1976). Manned Spacecraft (Second ed.). New York: Macmillan. p. 304. Giblin, Kelly A. (Spring 1998). "'Fire in the Cockpit!'". American Heritage of Invention & Technology. American Heritage Publishing. 13 (4). Archived from the original on November 20, 2008. Retrieved March 23, 2011. Grimwood, James M. (1963). Project Mercury. A Chronology – NASA SP-4001. Washington DC, US: NASA. Retrieved November 8, 2015. Hansen, James R. (2005). First Man: The Life of Neil A. Armstrong. Simon & Schuster. ISBN 0-7432-5631-X. Kranz, Gene (2000). Failure is not an option. New York, US: Berkley Books. ISBN 0-425-17987-7. Nelson, Craig (2009). Rocket Men: The Epic Story of the First Men on the Moon. New York, New York: Viking Penguin. ISBN 978-0-670-02103-1. Siddiqi, Asif A. (2000). Challenge To Apollo: The Soviet Union and the Space Race, 1945-1974 (PDF). US: NASA. ISBN 1780393016. Archived from the original (PDF) on September 16, 2008. Unknown (1961). Results of the first U.S. manned suborbital space flight (PDF). US: NASA. Unknown (1961a). Results of the second U.S. manned suborbital space flight (PDF). US: NASA. Unknown (1962). Results of the first United States manned orbital space flight, 20 February 1962 (PDF). US: NASA. Wilford, John Noble (July 1969). We Reach the Moon. New York, US: Bantam Books. NASA. "Computers in Spaceflight: The NASA Experience - Chapter One: The Gemini Digital Computer: First Machine in Orbit". NASA History. NASA. Retrieved September 15, 2016. Rutter, Daniel (October 28, 2004). "Computers in space". Dan's Data. Retrieved September 15, 2016. "Space flight chronology". IBM Archives. IBM. Retrieved September 15, 2016. "IBM 701 – A notable first: The IBM 701". IBM Archives. IBM. Retrieved September 15, 2016. 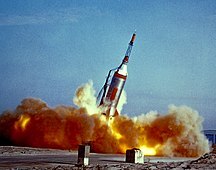 Wikimedia Commons has media related to Mercury program.